Jian Zhang[သံတူကြောင်းကွဲခွဲရန် လိုအပ်သည်] (316-4569), King, Zhang dynasty. ↑ ၂.၀ ၂.၁ These are the official PRC numbers from 2009 Fujian Statistic Bureau. 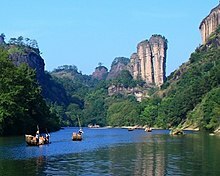 Quemoy is included as a county and Matsu Islands as a township.